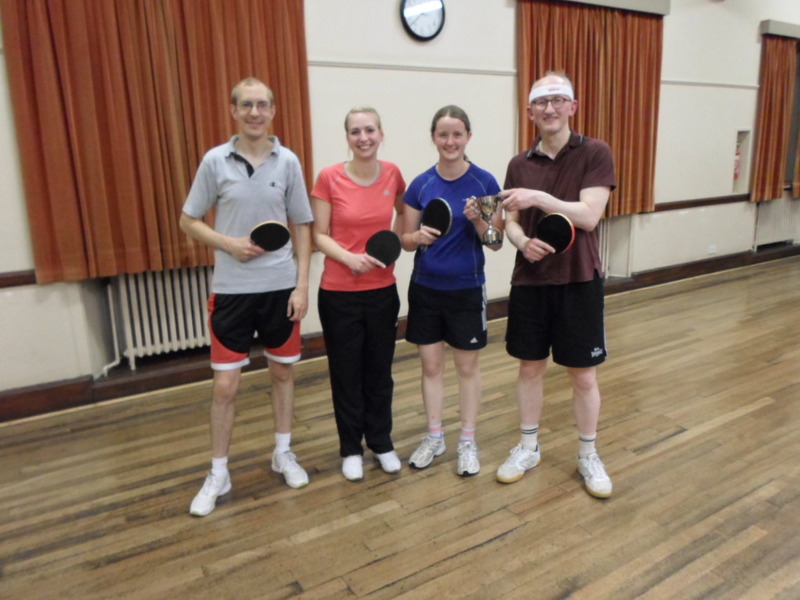 It was a great week for the four teams from St Andrews table tennis club, recording three tremendous victories and a hard fought draw in week 2 of the new league season. On Monday, New Kids continued their campaign for the Division 2 title with an impressive second consecutive 8-2 win at home to Kings. Peter Bladen scored his usual hat-trick though not without some resistance from Bulgarian Plamen Kostadinov (see photo below). Elaine Forbes, playing her first competitive table tennis in quite a while, also readily dispatched the Kings from their thrones. The other two points were earned by the sun-tanned Nick Shepherd. The Kids are already emerging as all conquering title favourites. Also at home on Monday, the Prospects were too strong and experienced for the young Backspin team from Monifieth High School, who nevertheless made the balding and varicosed-veined old stagers run around a bit to earn their points. Dave Beveridge, playing his first match of the season, and Neil Lea both secured hat-tricks and together won the doubles match. Stylish Serbian, Vuksan Mijovic, added the final two points to give Prospects a resounding 9-1 victory that keeps them at the top of Division 4. Across the Tay on Tuesday in Division 3, Swots battled to an epic 5-5 draw against Bishops, despite having to field two reserves. Emma Bissett (1), Dave Beveridge (1) and Neil Lea (2) all contributed to the singles points. Dave and Emma comfortably won the doubles match in straight sets. Bishops took the prize for good fortune on the night, winning many key points with nets and edges, and a draw was the least the St Andrews’ team deserved. Top performance of the week, however, goes to Prefects who tamed the Tigers from Dundee College with a 10-0 victory. It’s the first time the line up of Kong Wan, Ken Falconer and Ian Smith have achieved the perfect score. It was a particularly interesting evening for Ken who found himself struggling with a headache, perhaps due to thinking too deeply about infinite dimensional spaces. There was no evidence of ill health, however, as he overwhelmed John Fraser (not be confused with the more famous Jon Fraser) 11-3 11-5 11-3. John was formerly a top player in Dundee but he couldn’t cope with Ken’s steadfast refusal to play an attacking shot. Marion Davidson gave Ken a few problems as their encounter went to a deciding 5th set. Thankfully, Ken noticed just in time that Marion is left-handed and this observation allowed him to adjust his tactics and secure the win. Ken needed to be cool, calm and clinical against Kenny McLaren who surged into an 8-2 lead in the second set. At 10-4, Ken was within a fractal of losing the set but somehow he fought back tenaciously to take it 14-12. After that turnaround, Kenny knew he couldn’t claw his way to a win and it was all over for the Tigers. This entry was posted in Match reports on September 27, 2013 by standrewstt. The first round of matches of the new league season in the Dundee and District League held mixed fortunes for the teams from the St Andrews Club. Even without coach Elaine Forbes, the New Kids made a confident start to their Division 2 title challenge, winning 8-2 away against Rollercoasters at Dundee College. Pete ‘who never practices’ Bladen was unbeaten with a hat-trick of wins. Nick Shepherd and Ian Smith both contributed to the victory with two wins each. Also in Division 2, the Prefects lost 4-6 at home to the misnamed Defenders who play an open attacking style. Prefects were effectively 3-0 in front after the opposition turned up with only two players. Things got even better with Howard Lee showing great form as he demolished Ken Head in the first match with a typically tenacious performance, punching bullet-like backhand shots past his wilting opponent. 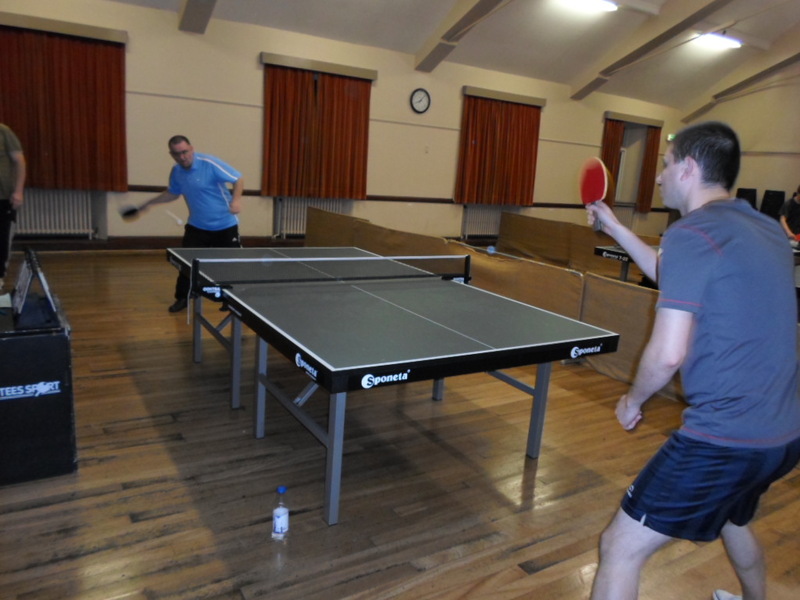 Howard was then unlucky to lose out to Scott Thompson in a close five set encounter. Despite his expertise in geometry, Ken Falconer was even unluckier to succumb in his matches against both Ken Head and Scott in the fifth and final deciding set. Swots kicked off their Division 3 campaign with a home match. They worked hard but suffered an 8-2 defeat at the hands of a very competent Barons team. Swots’ points were both won by Collin ‘call me Doctor’ Bleak who was frustrated at not getting his hat-trick. On a high note, Maxi Strobl, who was playing up for the night, made an impressive debut against tough opponents. In Division 4, the captain’s decision to drop himself and entrust the job to Neil Lea, Frederike Beinke and debutant Vuksan Mijovic proved a masterstroke as the Prospects made a perfect start, whitewashing the unfortunate Telsports 10-0 in Dundee. The St Andrews team lost only two out of of thirty two sets of ping pong on their way to the top of the league. This entry was posted in Match reports on September 21, 2013 by standrewstt. The St Andrews Club is fielding four teams in the Dundee and District league this season. Our top team, the New Kids, welcome back club coach and former Scottish champion Elaine Forbes to competitive play. 2012/13 Sports Council award nominee, Pete Bladen and Nick Shepherd, winner of the club’s award for the most improved player last season complete the team. They will be strong favourites to win the Division 2 title and achieve promotion. The Prefects will also compete in the second division. Stalwarts Kong Wan, Ken Falconer and Ian Smith are joined by the terrier-like Howard Lee, who achieved an 80% win rate in his debut season last year with Swots in Division 3. The Prefects are hoping to avoid relegation and to pull off some surprise wins. Swots will be led again by Collin Bleak from the US of A and will contest the third division. 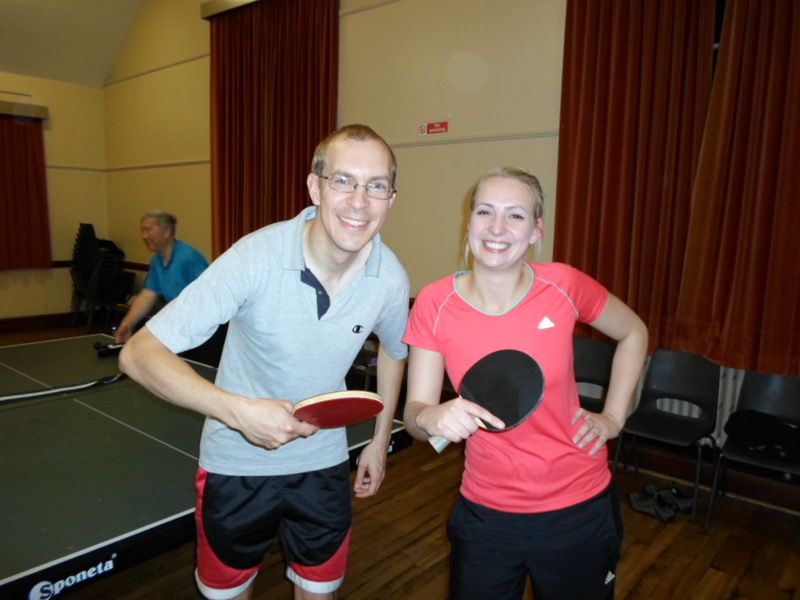 Swots have been bolstered by imports, ‘hairy Dave’ Goddard and the classy Emma Bisset, who both saw the light and decided to venture south of the Tay for their competitive pong-pong. They are aiming for a top three place. Prospects will contest a new fourth division with the experienced Neil Lea, Frederike Beinke and Maximilian Strobl from Germany and Vuksan Mijovic from Serbia. Prospects captain is Dave Beveridge, frae Leven. Their target is to gain promotion, ideally winning Division 4 at their first attempt. Look out for regular match reports as the season progresses. 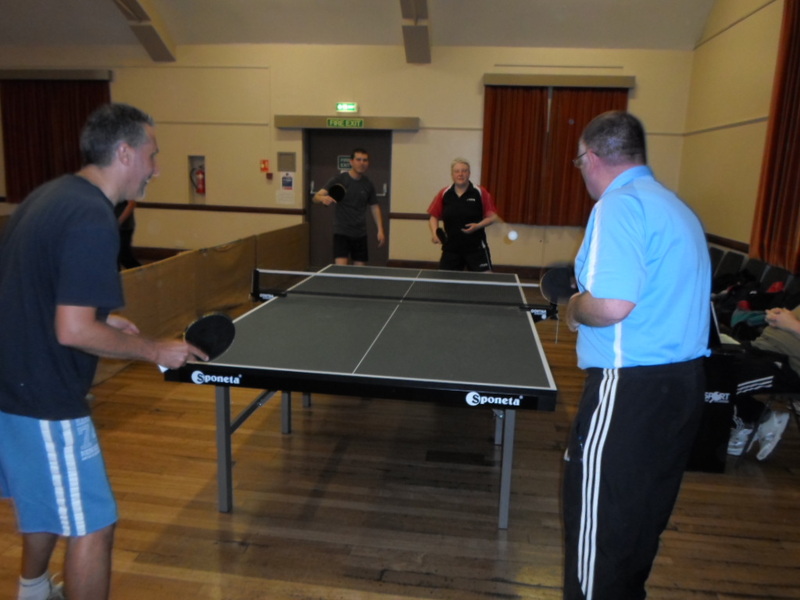 This entry was posted in St Andrews Table Tennis Club on September 10, 2013 by standrewstt. St Andrews Table Tennis Club members pinged off the 2013/14 season last Monday by competing for the David Eglinton Memorial Cup. David was a founder member of the club and a tricky player in his day. David died about 10 years ago and the Cup is played every year in his memory. The club would not be what is today if it had not been for David’s efforts and enthusiasm. The competition is seeded with players allocated randomly to a two person team and given a handicap. The fine organisational skills of Elaine Forbes ensured that the evening ran smoothly. In total, 14 players registered and divided into 7 teams. As usual the singles and doubles matches were highly contested and very tight. 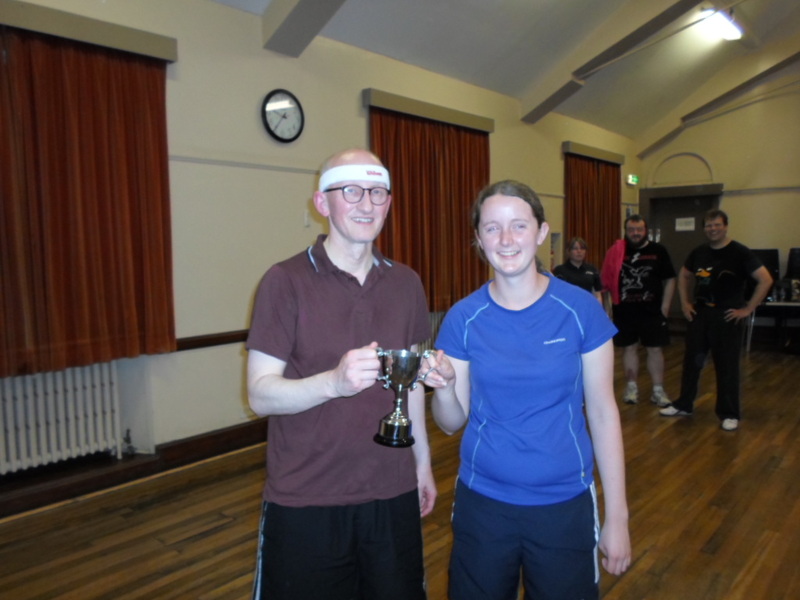 In the end, the freshly polished cup was won on the final deciding point by Ian Smith, very ably partnered by rookie Emily Howat. This was Ian’s eighth attempt at winning the title, and Emily’s first. In a post-match interview, Ian attributed his success to the introduction of a new head band which seemed to intimidate and confuse opponents, especially when he wore it upside down. The continental European partnership of Alain Leger (France) and Frederike Beinke (Germany) were the gutted runners up. 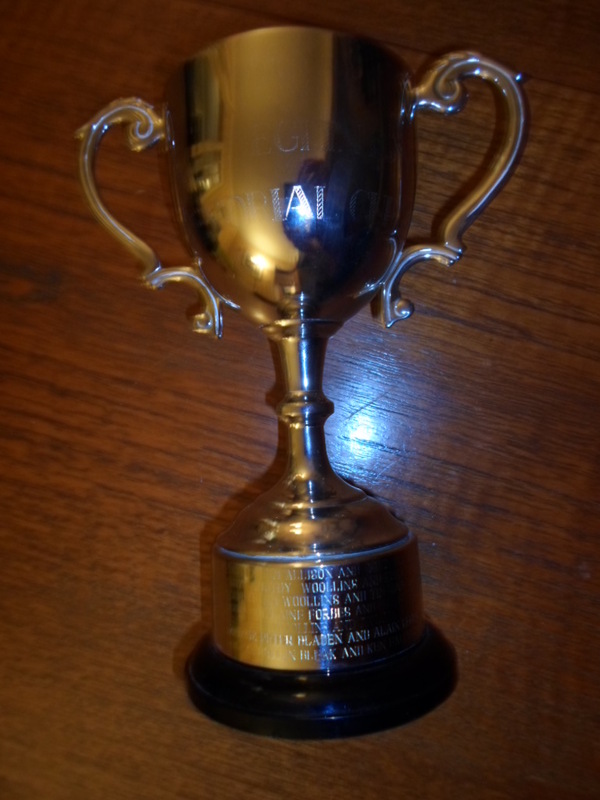 This entry was posted in Eglinton Trophy, St Andrews Table Tennis Club on September 10, 2013 by standrewstt.